e know that January is usually your “just trying to save until Valentine’s Day” month. But, if you’re not holding on to those purse strings too tightly, there are a lot of great deals just waiting to be scooped up with the arrival of the New Year. So, before you go bury your credit card under your mattress, check out this list for some of the best things to buy in January. Starting 2017 with a “New year, new me” mantra? Then some of the best deals on sports and fitness equipment are coming your way. Look for stationary bikes, treadmills, DVDs, gym accessories, winter sports gear and more. And if you’re looking to find a new gym (or start attending one), this is also traditionally the best time to get a deal on a gym membership. 2017 marks the start of our National Park Service’s second century. On January 16th, Martin Luther King Jr. Day, entry to all our national parks, memorials and monuments—from Acadia to Yosemite to Yellowstone, and even the Grand Canyon—will be free! This is just one of ten entrance fee-free dates to look forward to in the coming year. So, get out there and visit some of America’s special places! Can’t make it to a park in person? 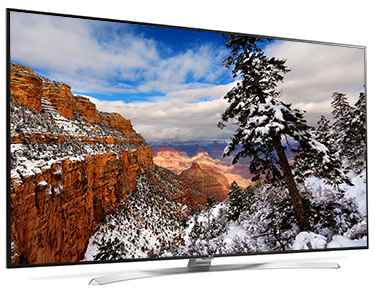 Stream footage directly from the National Parks Service on a new LG 55″ class Super UHD TV and simulate the experience in vivid 4K HDR. Get into the holiday spirit (again). It’s hard to believe, but the holiday season is only 11 months away! Put a little 2017 pre-holiday planning in action now and take advantage of 2016 post-holiday savings. Stores will be offering deep discounts on seasonal inventory like lights, ornaments, wrapping paper, cards and more. Get an even cheaper 4K TV. The Consumer Electronics Show happens in Las Vegas at the beginning of January every year to show off the latest and greatest innovations in gadgets and gizmos. And every year, that means great discounts on the electronics that just stopped being new. It’s best to look for TVs that range from 40″ to 55″. After all the crazy holiday discounts dry up, those mid-sized sets are usually still available for a decent price. Do you think you’ll be opening your wallet for any of these things in January? If so, which ones and why? Let us know in the comments below! All TV images shown are simulated. Not pictured – TV-to-AV Box cable (included) is required for TV operation. Please consult with your local installer for proper installation.